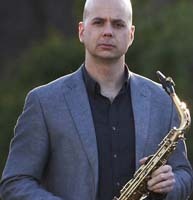 Jeremy Koch is an active saxophonist, chamber musician, and teacher in the Washington DC area. Principal saxophonist with the United States Air Force Band, he has been a featured concert soloist on national tours and performed with diverse artists such as: Tony Bennett, Wynonna Judd, and Kool & the Gang. Jeremy has performed at prestigious venues including Chicago Symphony Hall, Kennedy Center, and National Gallery of Art and regularly performs with the Fairfax Symphony Orchestra, Maryland Symphony Orchestra, Two Rivers Chamber Ensemble, Prince William Symphony Orchestra, Great Noise Ensemble, and recently toured Palestine with the Ramallah Orchestra. Jeremy is a founding member of the Atlantic Reed Consort, who made their Carnegie Hall debut in 2017. As adjunct saxophone professor at Shepherd University, he has presented clinics/recitals throughout the Washington D.C area and nationwide, including at the Universities of North Carolina, Missouri, Illinois, Florida, Delaware, North Dakota and Arizona State University. Carolyn Braus Alto Saxophone Originally from Bismarck, North Dakota, Carolyn Braus received her bachelor’s degree in saxoph . . .
Molly Orlando Piano Pianist Molly D. Orlando is recognized as a soloist, collaborator, and teacher throughout . . .